We've had a busy week. 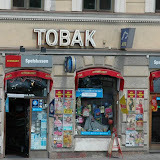 After four days my parents arrived in Stockholm after using three different trains, two ferries and a bus. Their luggage is presumably still in Amsterdam and who knows if they'll ever see it again. This morning my sister-in-law with family finally took off, five days delayed. Things were looking good enough at 4.20 am this morning - there seemed to be a flight inbound for Chicago (through which they are transferring from here) and there was an estimated departure time and they had confirmed, re-booked tickets.So they took off for the airport and the Chicago flight. But when the airport information system in Chicago showed other information than the SAS flight system when arriving there, we were not sure what to think. 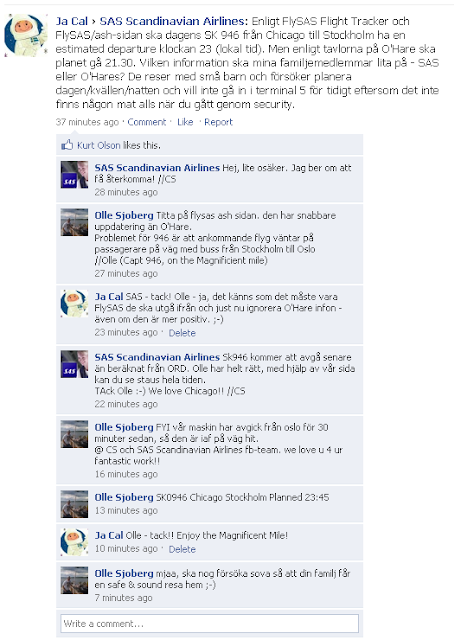 Turns out SAS has a pretty active Facebook team and they have been working non-stop the last couple of days providing people with information to the extent that they could answer (after all - no one really knows where these ash clouds were heading and with authorities unclear with what rules should apply it's sure been a virtual nightmare for everyone trying to have some kind of answer). 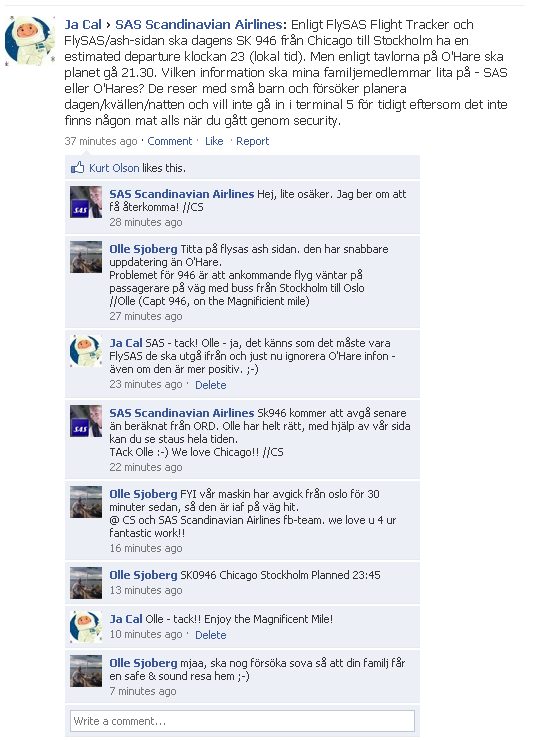 This is the conversation I had with SAS on Facebook this morning - and the captain of the actual flight I'm asking about was online and could help confirm the information we needed (You don't want to go through security at O'Hare's terminal 1 unless it's just minimum time until your departure - for some reason this international terminal, from most international flights (ie LONG flights) depart at O'Hare has no food in any form once you've gone through). I like what social media can do with organizations and their communication. You might ask yourself why the same information can be as informal and readily accessible on their actual business websites instead of Facebook - but hey - as of today - we got our answers so I'm happy. And what could be a better confirmation of a flight than the actual captain. Tackar så mycket för tipset om SAS på Facebook, det hade jag aldrig klurat ut på egen hand. Ska flyga till Sverige på måndag från Washington DC men vet inte ens hur jag ska hitta bra information, detta lär hjälpa. Mycket! Ja, Jacal, det var tack vare dig och Charlotte i CT jag upptäckte SAS på FB, vilken toppenservice. Och vad trevligt kaptenen svarade dig. Hoppas nu att altl gick bra. OCh för dig också Ulrika som ska flyga från Dulles nu på måndag. Du får kolla SAS via FB. Timmar i telefon utan resultat, sedan tog det femton minuter att fa svar pa Facebook. Stort tack igen. i love your blog- did you stop blogging? Make a final post please. 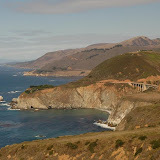 Dear all - sorry for not answering back - had to take a unexpected break - but never had any plans to stop blogging - now I'm back - this is after all one of my fun things in life - to contemplate about my life here. Thanks for reading!